The Ridgefield Theater Barn is mounting a family-friendly holiday event this December: It’s A Wonderful Life: A Live Radio Play, based on the original Luxe Theater broadcast. Directed by Erik Tonner, performances run Dec. 6 to the 16, Thursdays through Saturdays at 8 p.m., and Sunday December 9 and 16 at 2 p.m. 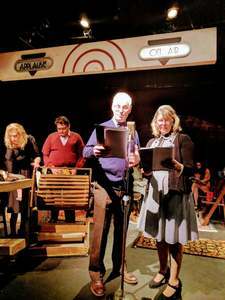 Similar to the story made famous by the Frank Capra film, and featuring many of the same lovable characters, the radio play incorporates live sound effects and commercials from the era. The play will be brought to life by Rob Mayette, Sebastian Donnelly, Dandy Barrett, Rick Haylon, Jake Levi, Scott Schulte, Larry Greeley, David Fritsch, Ricky Pollack, Catherine Malloy, Rick Hodder, Christine Hruska, Alice Layton, Patricia Holzhauer, Anne Testa, Emmanuelle Krolick, Delaney Tonner, Barbara Disraeli, Valerie Huegel, Lori Federico, and Lisa Tancredi. The Ridgefield Theater Barn is located at 37 Halpin Lane. Seating is cabaret style and audiences are encouraged to bring food drinks to enjoy before the show. Doors open one hour prior to curtain. Tickets, both for individual performances and for the entire season, are available at ridgefieldtheaterbarn.org.